European Council President Donald Tusk reveals his plans for Brexit. The payments that London must make to the EU to settle financial commitments made when it was a member are considered one of the most difficult Brexit issues. Twenty-seven EU leaders on Saturday formally approved their guidelines for Brexit negotiations at a summit in Brussels. The EU 27 insist on a “phased approach”, namely that Britain settle the terms of its divorce before any talks on a future trade relationship can start, hopefully by the end of 2017. “Before discussing the future, we have to sort out our past,” Tusk said on Saturday. The first divorce issue the EU wants to settle is the fate of the 3.2 million EU citizens living in the UK and 1.2 million Britons on the continent. EU rules currently guarantee people to live and work wherever they choose in the bloc, as well as giving them and their families access to welfare benefits. Poland and Hungary, with big populations in Britain, have demanded that EU citizens who have already been living in the UK for five years should have the option to remain permanently. 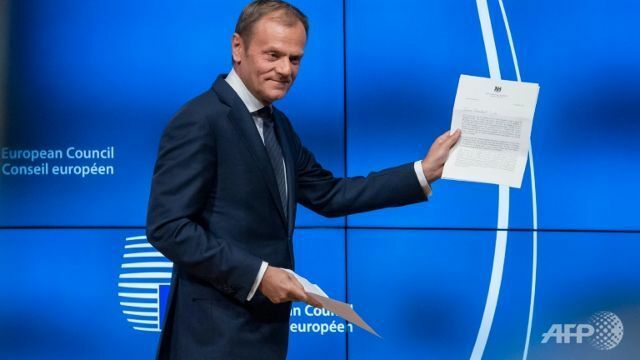 Tusk said this was the “number one priority” and urged a “serious British response”. Luxembourg Prime Minister Xavier Bettel said the demands on London were estimated at between 40-60 billion euros ($42-65 billion), a politically toxic figure that Britain disputes. “This is the most politically sensitive point in the first phase,” a senior EU source said, adding that it is better to tackle it sooner than later. “Sometimes if you have to go to the dentist you want to postpone it as much as you can, but you have to deal with it,” the source said. It would be an EU external border after withdrawal but Dublin has warned of renewed conflict if the issue is not handled with extreme care. “In view of the unique circumstances on the island of Ireland, flexible and imaginative solutions will be required, including with the aim of avoiding a hard border,” the guidelines say. The EU 27 separately backed a clause in the summit minutes — but not the guidelines — advocating automatic membership for Northern Ireland after Brexit if it ever reunifies with Ireland. The guidelines say that talks on future relations — particularly an EU-UK trade deal — should only start once the EU 27 unanimously agree there has been “sufficient progress” on the divorce questions. The EU 27 guidelines say they are aware that talks on a trade deal are too complex to be completed by Brexit at the end of March 2019, and so “transitional arrangements” are therefore possible. However, they must be “clearly defined” and “limited in time”, with a hard deadline that is previously agreed. In the transitional deal, Britain would still remain under EU control and jurisdiction, with ultimate oversight by the European Court of Justice. This is a bitter pill for London. The rocky outcrop in southern Spain has belonged to Britain since 1713 and is regularly reclaimed by Madrid. The guidelines state that “no agreement” after Brexit between the EU and Britain could apply to Gibraltar without a bilateral agreement between Madrid and London.